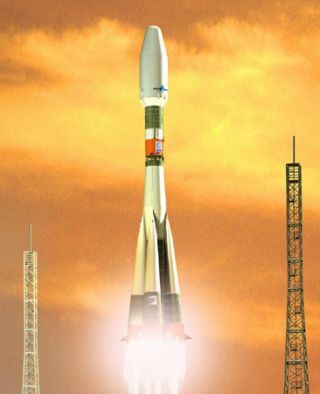 Artist's concept of Soyuz launch depicted from French Guiana. PARIS— The European version of Russia’s Soyuz rocket will not make itsinauguralflight until the spring of 2011 and may be further delayed depending onwhichof two government customers is selected for the flight, the head ofEurope’sArianespace launch services consortium said Sept. 7. ArianespaceChief Executive Jean-Yves Le Gall said the Hylasconsumer broadband satellite owned by Avanti Communications of London,whichhad been set for the inaugural Soyuz flight from Europe’s Guiana SpaceCenterspaceport, willnow be launched in late November as a co-passenger onEurope’s Ariane 5 ECAheavy-lift rocket. Theintroduction of the medium-lift Soyuzrocket to the Guiana center has been delayedon multiple occasions, with the arrival and construction of amobile gantrybeing the main cause of the delays. Ina press briefing here during the World Summit for Satellite Financing,Le Gallsaid the launch pad is completed and will be ready to support flightsstartingearly next year. But he said it is not clear whether the ground segmentfor thePleiades satellite will be ready until the spring. Ifthe two Galileo demonstration satellites are selected for the inauguralSoyuzflight, the launch could occur in the spring. Galileo officials havesaid theydo not want to launch their spacecraft on the Soyuz inaugural flight.Le Gallhad said that the 18-nation European Space Agency has indicated this isnolonger a problem.